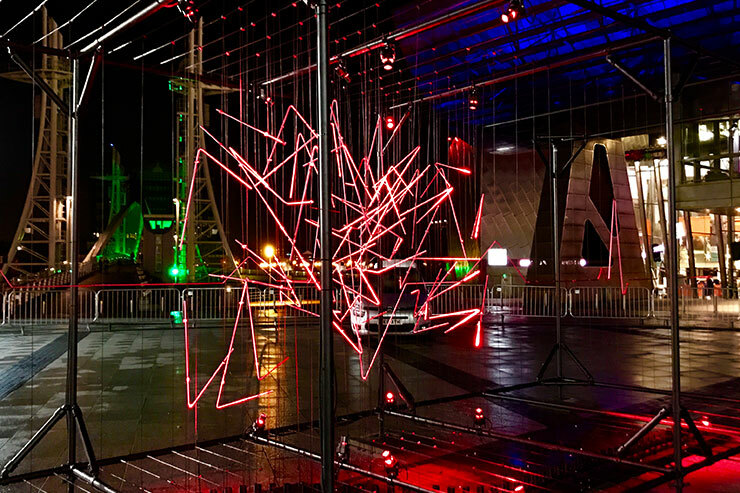 British based GNI projects were commissioned in December 2016 to create a new exterior light art installation, Heart Beat, for the Lightwaves festival in Salford Quays. 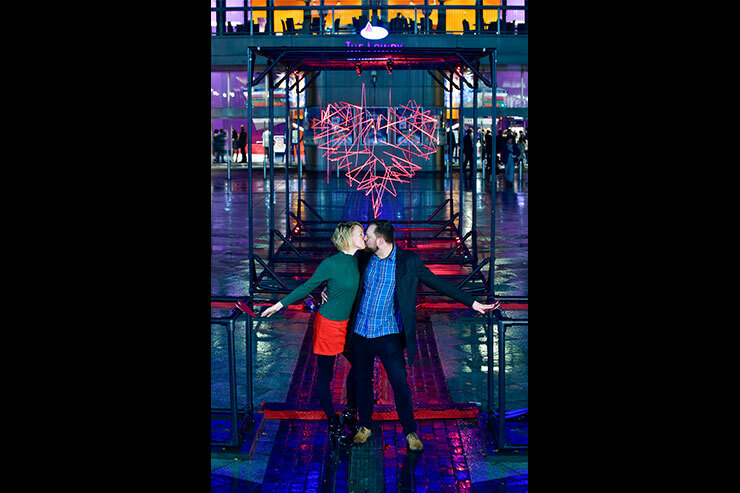 Heart Beat encourages visitors to make a connection of love or friendship, by joining hands in front of the sculpture to complete the ‘circuit’ and reveal the symbol of the heart. 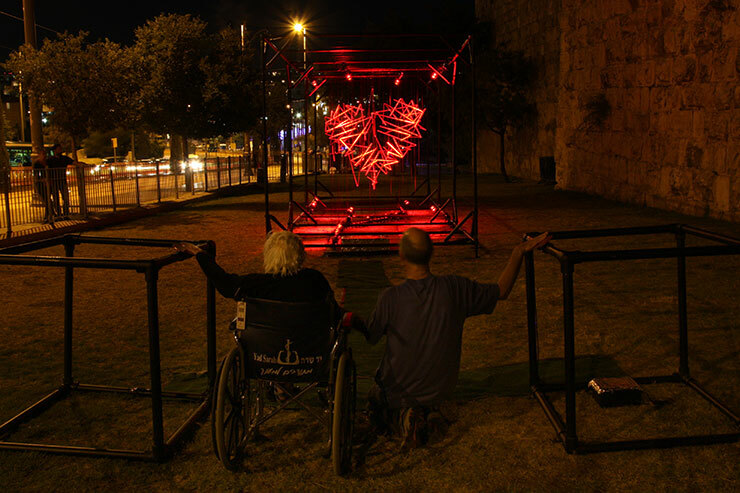 Heart Beat is an extension of the GNI projects light loves collection, where the team have experimented with iconic heart imagery created in various illuminated media and for various events. The heart itself is only visible from one viewing angle, and for five seconds, after people have activated it by joining hands or kissing. 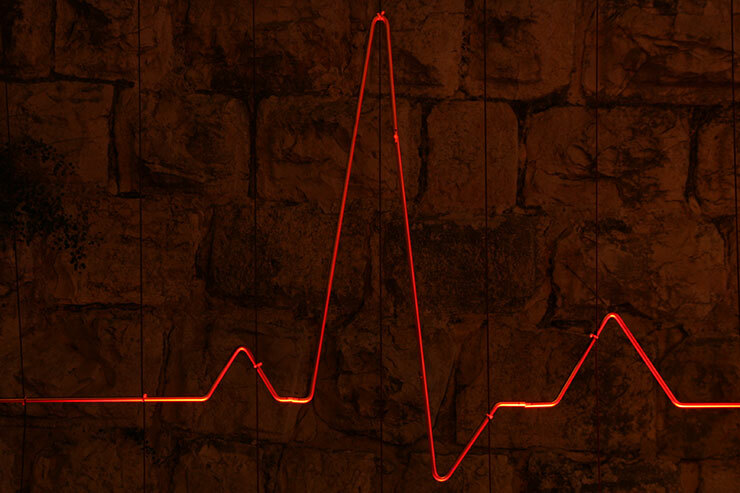 The installation measures 3 x 3 x 9m, and when viewed from the side consists of an always-pulsing heart beat in the form of an electrocardiogram wave. 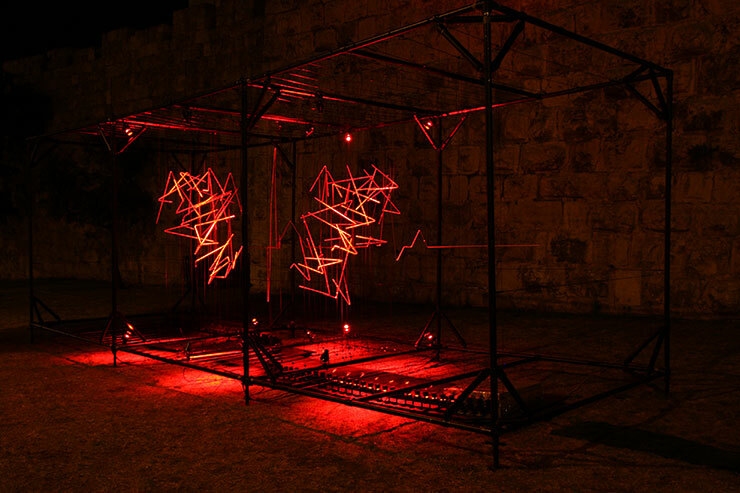 The beating 3D core of the sculpture indicates life and attracts visitors to explore the piece by walking around and experiencing the abstract forms from various viewing angles. 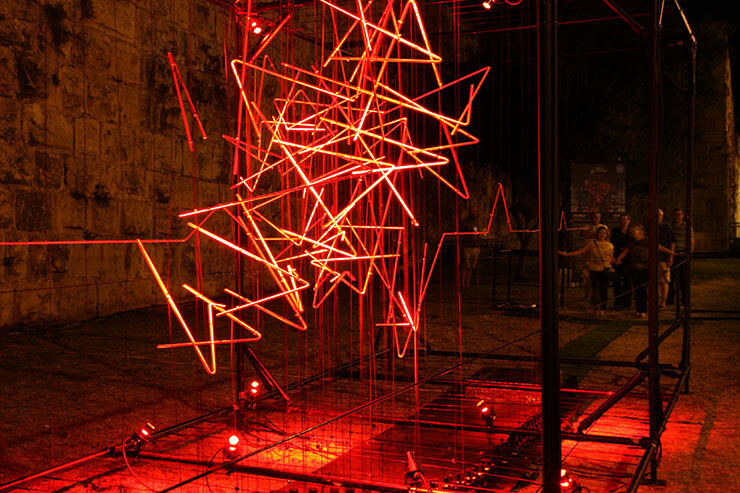 When ‘heart mode’ is activated external viewers can see many different perspectives of the same sculpture. Sometimes they see totally random distantly spaced lines, sometimes swarms of angular crossing lines and sometimes fragments of the heart, or a heart broken in two pieces by the pulse. Only people drawn together at the optimal vantage point see the heart in its true form. 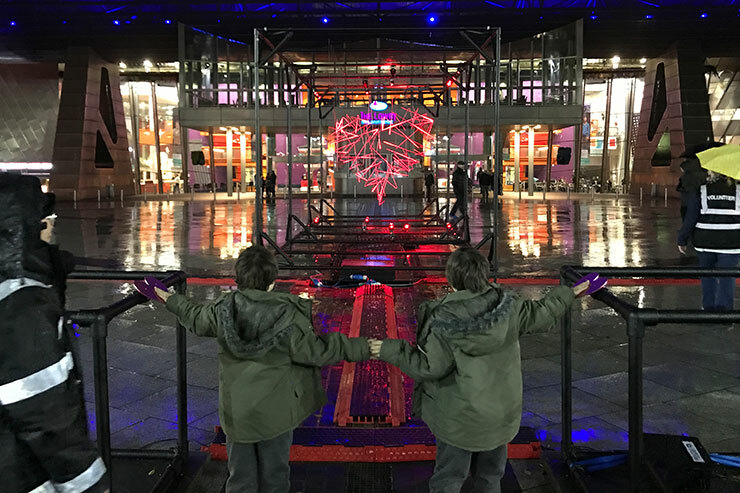 The piece was conceived to be publicly accessible to all, bringing people of all ages, connections, races and religions together, with positive energy, and since its first showing in Salford the sculpture has also been shown at ‘Lights in Jerusalem’. 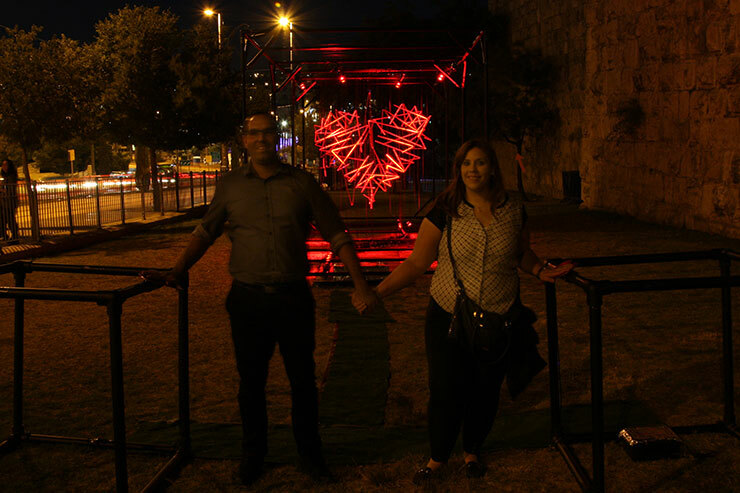 GNI projects were moved by the public reaction to the work, seeing parents and children, young couples and older couples, friends and entire families, joining together with smiling faces to activate the heart, and the piece has also been used as a location for a marriage proposal. 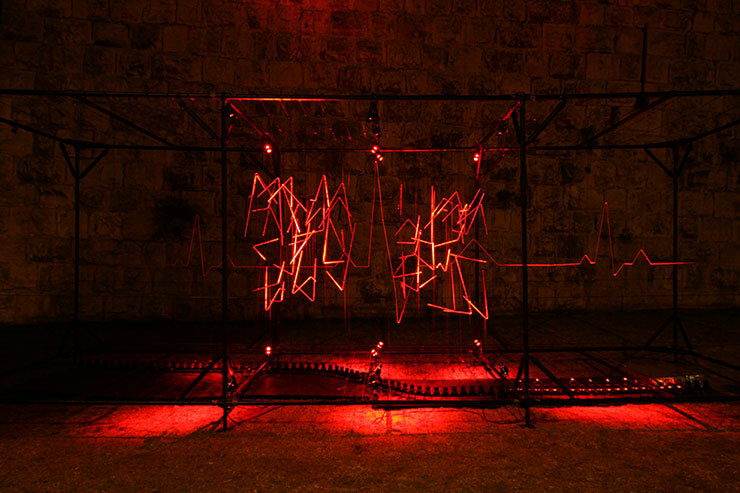 The suspended elements that sketch the imagery are not electrified; they are made from anodised aluminium illuminated by highly saturated narrow focused red spotlights from below. These spotlights are divided in to two groups. The first group an ‘S’ shaped swathe that follows the ECG pulse, chasing to create the drama and pulsing animation, and the second group switched on by activating the heart shaped sensor pads by joining hands. The sensors are too far apart to activate alone, and cannot be activated without being joined via the visitor’s body resistance, this can be achieved by holding hands, high fives or kissing, promoting connection to each other and the art itself. All light fittings were bespoke manufactured with precise optics and long snoots to minimise their presence and any potential glare from all pedestrian viewing angles, allowing the heart and pulse to take prominence. 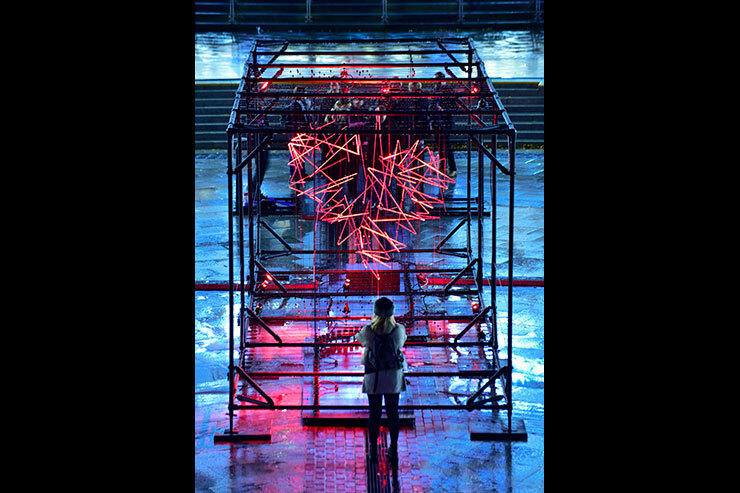 The light fittings are DMX controlled and heart elements are hung by hand on site by the GNI projects team to ensure the heart is accurately rendered for the viewer.